Historically, Ireland was (1)_______________ into the four provinces of Leinster, Munster, Connacht, and Ulster. Today most of Ulster is now Northern Ireland, part of the United Kingdom. The Republic of Ireland (2)_______________ five-sixths of the island. Its capital is Dublin. 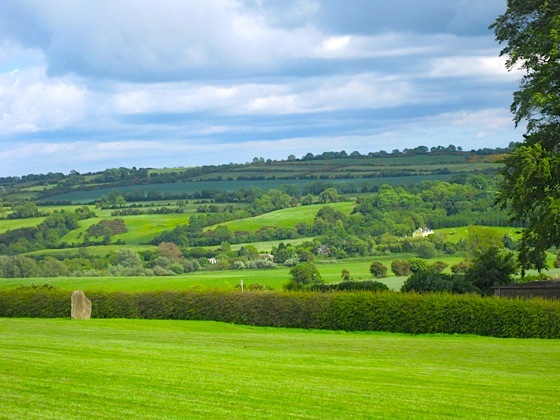 For a real brush with history, travel to the Boyne Valley in County Meath and see Newgrange. This massive tomb is (3)_______________ in purpose to the Pyramids of Giza, though it was built over five thousands years ago, before the Pyramids were even a twinkle in a Pharaohs’ eye. Ireland’s Stone Age (4)_______________ built it to house their honored dead. At sunrise on the winter solstice, the (5)_______________ day of the year, a beam of light enters the central chamber. What significance this had for the builders is a still a matter of (6)_______________ . Enter the tomb and decide for yourself. The experience is illuminating. Ireland has produced a plethora of castles, churches and towers. Its monasteries became important centers of (7)_______________ during the Dark Ages and its fortresses were strategic battlegrounds against the island’s frequent (8)_______________ . The Rock of Cashel, near Tipperary, served both a secular and (9)_______________ function. According to legend, this fortress of the Munster kings was visited by St. Patrick himself and eventually became an important medieval cathedral. If your tastes cater more toward scenery (10)_______________ history, you’re in luck. Opportunities abound. Near Galway, the Cliffs of Moher rise more than 650 feet from the sea providing dramatic (11)_______________ of the coast. Also (12)_______________ are the surreal landscapes of the Burren with its cracked limestone and brooding ruins. When it’s time for more (13)_______________ pace…you can travel along the River Shannon…(14)_______________ horses in the Connemara…or stroll through quaint towns and lush countryside, colored in Ireland’s forty (15)_______________ of green.